witchdoctor, GLBright, Janibrewski and 12 others like this. Last edited by imagic; 12-20-2016 at 08:45 AM. Great review! I had also been wondering if the harsh tones from Klipsch horn loaded speakers would be mitigated by their new design. I have inexpensive Synergy F-20's that have definitely made me a Klipsch fan because of their efficiency and ability to play loud. Thanks for the review! What's the MSRP for these? 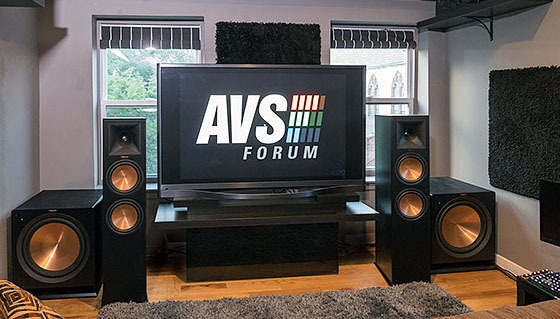 Hi Mark - how do these speakers compare against the SVS Prime Towers you recently reviewed? robdman and spddy101 like this. OMG i have these speaker and dam the bass is insane!. when i first received them i thought really hard if i needed a sub ^_^. totally worth the cash. awesome design and audio quality. Also can you recommend a cross over frequency that will allow it to produce clean bass but pass the big stuff to the subwoofer? i am watching War of the Worlds right now on 50hz down from 120hz and up from 40hz. does the lower cross over muddy the voice clarity or am i misinformed? . Not sure if you mentioned it might have missed, but was the DDRC-88A with Dirac Live engaged for every single track, or did you alternate with and without Dirac? Here's the graph from Dirac Live. Tons of output at 50 Hz. labman1, Dom Di Stroia and MrGrey like this. Wow! Those are some crazy height speakers mounted to the ceiling! cuzed2 and ControlZ like this. IMHO, using Dirac Live for the entire review is just wrong. $1350/pr for the speakers. Then add in the cost of the DDRC-88A. And a calibrated mike. You weren't reviewing the speakers in even a semi-normal environment. You were reviewing the software that adjusted the speakers to your room. I can imagine a scenario where almost any speaker adjusted to the parameters you choose will sound very similar in your studio. Speakers should be reviewed without external adjustment/compensation. That's the only legitimate way to compare one to another. Given the availability of EQ and room correction on modern AV gear, I disagree. Indeed, I plan to make Dirac Live a part of all my speaker reviews. jcr159, Merlin521 and bombertodd like this. Last edited by imagic; 05-26-2015 at 08:39 PM. I would be interested in seeing these or any speakers tested with Dirac live vs Audyssey XT32 vs Audyssey Pro. Mark, have you experimented with Dirac Live and compared it against a modern AVR's built in EQ (say MCACC or Audyssey)? I'm curious if Dirac Live really makes that much of a difference as compared to the built in EQs in higher end AVRs. Yes, I have compared it to the lastest MCACC in my Pioneer Elite SC-85 and to Audyssey MultEQ XT (but not XT32). Does it do an explicitly better job? That could very well be a matter of opinion. One of the reasons I'm using Dirac Live is it's available in a stand-alone box (the miniDSP DDRC-88A) that I can use with just about any pre/pro, AVR with pre-out, and any amp. If I am going to use room correction—and my room is not perfect so I'd rather use it than not—I prefer a solution I can implement in any system, rather than being tied to what's provided by any given manufacturer. I am working on a DDRC-88A review for this week. I do think Dirac Live is effective. lovinthehd, jhughy2010 and Madmax67 like this. If you haven't already, you might try listening to the results if you don't boost the frequency extension with Dirac. With treble especially, I have found that boosting the natural extension creates an harsh/edgy sound, and that I preferred it unboosted. This is not a problem, however, with speakers that can recreate upper frequencies without boosting. I am guessing that the problem is that the speaker designers roll off the treble to keep distortion below audible levels, and that boosting it raises the distortion above audible levels. I think it would be most useful if the sound quality was reviewed both with an without Dirac. stef2 and smurraybhm like this. 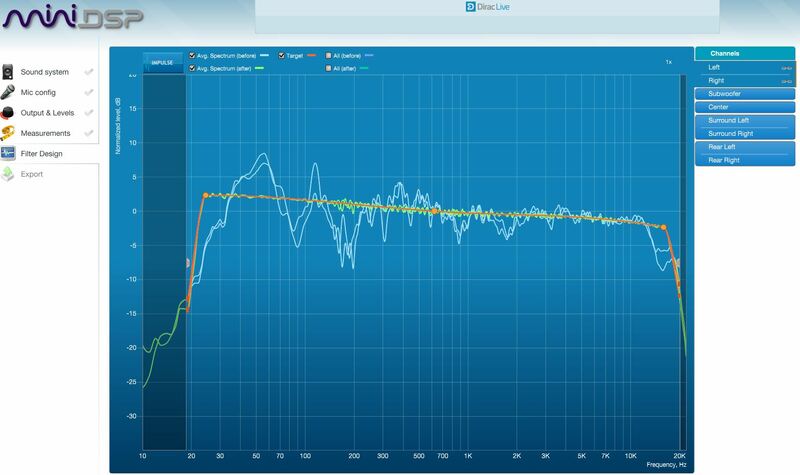 My experience comparing Dirac Live (PC version) to Audyssey XT32 Pro is that Dirac Live gives MUCH better control and results. I found the difference to be similar in magnitude to getting new speakers. Sure. Here goes: Without Dirac Live, the sound was not as well-balanced, especially in the bass region... but that's my room's fault as opposed to the speaker's fault. Very few people have a near-perfect room, nobody has a perfect room. In relative terms, many people have room correction software in their AVRs and pre/pros. 'Nuf said. If I review speakers without Dirac Live (or other room correction/EQ solutions), I'm really reviewing my room and not the speakers, even though I understand some people think that by using room correction, you are reviewing the software itself and not the speakers. IMO the benefits of using room correction for all of my listening outweigh the minuses, and I can't please everybody. In future reviews, I'll consider writing about comparing one or two tracks with and then without Dirac Live. But that's not a promise. prerich, gskinusa, lovinthehd and 2 others like this. Last edited by imagic; 05-27-2015 at 07:46 AM. ...During critical listening, I sat precisely centered in the MLP. I played each track at least twice, once with the speakers running full-range and once with the twin R-115SW subs. I used the DDRC-88A with Dirac Live processing during all of my listening sessions. When paired with one or more competent subs such as the R-115SW, the RP-280Fs offered an abundance of dynamic headroom, without suffering cone-excursion limitations in the deepest bass notes. Thanks to 8-ohm impedance, they are a good match for almost any amplifier, AV receiver, or integrated amp. I gather in your 1800 cu ft room most any AVR should be able to drive that setup in a multispeaker configuration, but noticed that Klipsch labels the RP-280F as "8 Ohm Compatible"--Does that mean that they probably have lower impedance dips and harder to drive than the 98 dB Sensitivity rating suggests? If so, is that something someone should consider when selecting AVRs and/or external amps? It's almost certain there are dips since all speakers vary. But I doubt it's enough to give an AVR a hard time. I'm curious to see some measurements. This is strange: the comment to which you are responding doesn't exist. The real surprise was how well the horn-loaded tweeters handled the sharp sounds from Herbie's keyboard. The biting, cutting quality of the synthesized sounds came through, but without excessive sibilance that would make it unlistenable. Anyone who thinks Klipsch means harsh highs is in for a big surprise when they hear the new horn on the Reference Premiere towers. The speakers have been re-eq'd. You can eq out peaks that would have made the sound bright or harsh. And since eq has been applied, I don't know whether the comments above are more a review of Dirac processing or the inherent design/character of the speaker itself. In my work I'm eqing out harshness, brightness, hisses and hums from a huge variety of sound files almost every day. It takes sometimes takes very little eq to alter the character of the sound...sometimes a lot....but you generally won't know by listening to the equed result that the original had an issue, or how prominent that characteristic was before being remedied. A review that automatically applies eq to the speaker leaves me in a similar situation. What does the original - the item I'd actually purchase - sound like? But I won't comment on this for future speaker reviews; I'll just accept that the reviews here won't quite be for folks like me, with my old fogey notions of speaker reviewing. Marc, that aside, I am very intrigued by Dirac and you are one of the guys I'd turn to for such a review! airgas1998, Dom Di Stroia and jhughy2010 like this. Great point. My primary use for room correction and EQ is dealing with the mess below Schroeder. I'm totally open to leaving the mids and highs alone for some of the listening process, and while I cannot discuss specifics of a forthcoming update to Dirac Live from miniDSP, I can offer a hint... it will offer a lot of flexibility. And, I can (and should) speak to your point... the highs were smooth without any EQ or processing applied. I also want to point out—to everyone—that I participate in the discussions of all my reviews. The posted review is never the end of the story, like it is in a magazine. I appreciate constructive feedback but these are things that could be framed as questions as opposed to criticisms of my process. I always have the speakers I review on-hand when I post the review, in case I need to go back and check something, or I missed something, or just to follow up. ellisr63, Kingdaddy2000, gskinusa and 2 others like this. Last edited by imagic; 05-27-2015 at 09:00 AM. Excellent explanation!!!! People fail to realize that there are only 2 components that you actually listen to....the speakers...and the room!!!! I have owned speakers that I loved - changed my room - then I didn't like them as much. Some speakers need a reflective room (Atmos is a game changer in more ways than one), others prefer a dead room. Seeing that most speakers are measured in anechoic chambers, but we don't live in one, we would definitely need room correction (starting with physical treatments). I don't have Dirac Live, but I've heard wonderful things about it! I'm actually using a vst plugin via JRiver for my 2 channel and bass correction (MathAudio Room EQ). It actually does a better job on my system than Audyssey MultiEQ (I haven't had the ability to use XT or XT32). I don't see myself listening without EQ ever again. Keep using Dirac Live when you review - yeah, you can do comparisons with and without - but to know what the speaker really sounds like - we'd need to be at the testing facility. Carry on and excellent review! I wonder how those compare against the more expensive, but older RF-7...? I do too, but I've only heard the RF-7II in someone else's home theater, not in my studio. So I cannot compare. Nice review... Nice and technical, which is how us Audiophiles and Klipscheads like it! That makes two of us that are curious about those ATMOS overhead speakers. Perhaps imagic will go beyond teasing, and elaborate ? Sure. Those are GoldenEar HTR-7000 speakers mounted in the actual enclosures the company used at CEDIA 2014. They are meant to sit in a drop ceiling. I was so impressed with the sound I asked if I could review a similar system, but instead I got my hands on the exact same system. Since I rent, cutting large holes in my ceiling was not an option for implementing Atmos, and I prefer ceiling speakers to the reflected sound approach, although I do have a system (Pioneer Elite) capable of that. That is very likely your room. Do you have a room profile to compare against? I have a similar peak at 50hz. Dom Di Stroia likes this.